Cooking lechon paksiw is just like cooking adobo but I like to saute garlic and onion first then the lechon for more flavor although some don’t really add garlic or onions anymore. Paksiw has more vinegar than adobo, which makes it tangy and somewhat sweet because of the brown sugar added and peppercorns provides the little heat; I like to add red chilli flakes whenever I have some to give my lechon paksiw more zzing! I didn’t put the quantities of ingredients because I don’t really measure anything when making this. It’s a matter of tasting it as you cook, let your taste be your guide..you won’t ruin it don’t worry just don’t add a lot of water so it’ll be easier to adjust the seasonings. Lechon or roast whole pig is delicious when hot off the roasting pit; any left-overs is usually made into paksiw na lechon which is so delicious, too! Heat a little oil in a pot, saute garlic, onion; add lechon, crushed peppercorns, sugar, soy sauce, vinegar, banana blossoms. Stir and add a little water about ⅓-1/2 cup. Let it boil over high heat then lower heat to medium low and let the mixture simmer for about half an hour. Add the liver spread to thicken the sauce, add more water if you want the consistency thinner or a little runny and simmer some more if you want a thick sauce. Enjoy the Holidays! GOD Bless! 2 Responses to "Lechon Paksiw"
A roast pig? I’m about to faint, this makes me so happy. 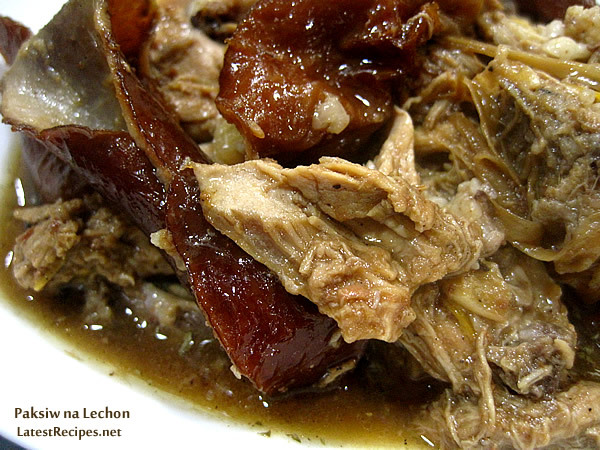 Yum, yum…love paksiw na lechon!